This four bedroom villa on the much sought after gated community of Emerald Island has something for everybody - the fantastic location, a games room, spa, wi-fi and space for the whole family. Queen-size bed, walk-in closet, TV. En-suite bathroom with corner bath, large shower cubicle, his ‘n’ hers sinks and separate WC. Queen-size bed, closet, TV. En-suite bathroom with shower over bath, sink and WC. Family bathroom between bedroom 3 and 4, with shower over bath, sink and WC. Situated on the popular Emerald Island resort in Kissimee, this four bedroom villa has something for everybody - a games room, wi-fi, relaxing spa, a fair degree of privacy at the back of the villa with no close, directly overlooking rear neighbour and all just a short drive away from a wide range of shops and restaurants. Living Accommodation - The entrance of the villa leads directly to a quiet lounge with comfy sofas - the ideal place to sit and relax after a busy day at the parks. Next comes the formal dining area with a table and seating for six people, the kitchen is at the heart of the villa with a breakfast bar and an additional dining table. The second lounge, at the rear of the villa is bright and airy and has comfy sofas, a flatscreen TV and doors leading to the pool deck. Bedrooms - The first Master bedroom has a Queen-size bed, en-suite bathroom and a walk in closet. The second Master bedroom also has a Queen-size bed and en-suite bathroom. Bedrooms 3 and 4 are both twin rooms and have been decorated in a style to suit any holiday maker. Outdoor Living - The south facing pool deck, with private pool and spa, has plenty of space for the family and benefits from having no close neighbours to the rear. Entertainment - The games room has been equipped with a pool table, air hockey game and table football. The world famous Emerald Island resort is tucked just off the famous US192 and is, as its name suggests, a jewel ready to be enjoyed. The elegant dolphin statue at the entrance of the community leads the way to the manned gated entrance. Disney theme parks are situated just a few miles away and the bustling US192, renowned for its shops and restaurants, is even closer. 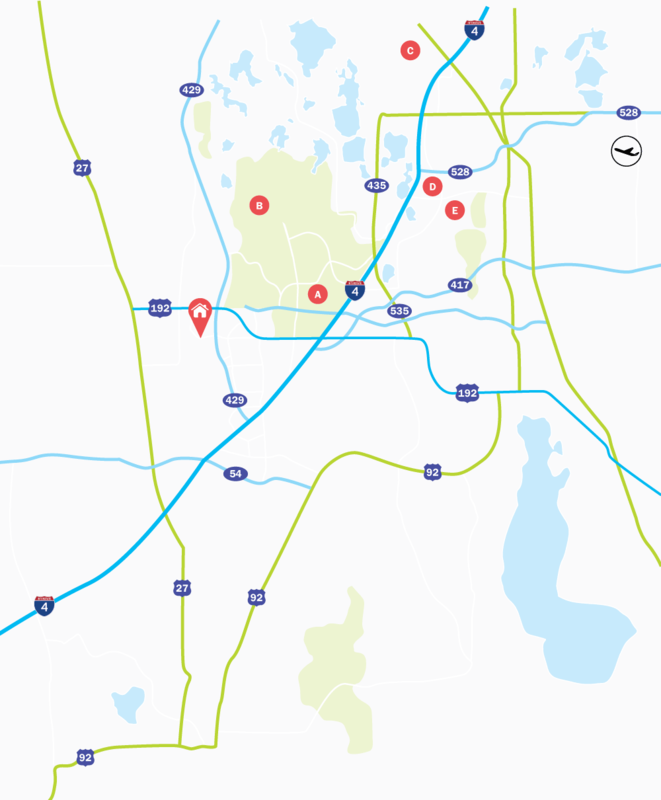 The I-4 highway leading to Universal, SeaWorld and some of Florida’s finest beaches is just a short drive away.